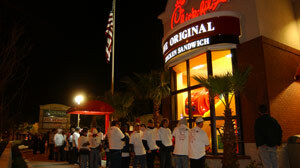 Avid following: Chick Fil-A fans in St. Petersburg, Fla., line up for a free meal before a new restaurant opens at the stroke of midnight. The celebratory campouts before Chick Fil-A openings evolved as customers hungry for chicken and fun started showing up earlier and earlier to take advantage of the chain's free meal deal. Where's the new hottest place to be on Wednesday nights? Judging by the size of a recent crowd in Dallas, it's parking lots. But not just any parking lots. The real action is on the asphalt outside soon-to-be opened Chick fil-A restaurants. Four years ago, in order to get publicity for new Chick fil-A openings, the restaurant chain began offering a free chicken sandwich meal once a week for a year for the first 100 people through the door. As word of the grand openings spread, people started coming earlier and earlier for a place in line. So, Wednesday mornings around 6 a.m., tents sprout up and lounge chairs appear, and for the next 24 hours, there's a party -- with lots of dancing, games and plenty of time for just hanging out. Getting the coveted First in Line spot in Dallas was Paul Kingery of Norman, Okla.
"We did a roundtrip from Norman, me and another couple," he said. "I don't know what it is. It's just like, let's do that. It's just a cool company. They're really nice to let us do this, we have a good time." That's more than 300 miles for this roundtrip. Kingery said he and his wife (No. 2 in line) would save $600 this year with the free meals. But while they appreciate the savings, he said, they go because of how they're treated at the restaurants. "The chicken is great, but their values -- you say 'Thanks,' they say 'My pleasure,'" said Kingery. "I think that's cool." Juan Sierra, a self-described "raving fan," had only travelled around the state of Texas for openings. But so far, he'd been to 41 of them across the Lone Star State. At another opening in La Plata, Md., campers were eager to show off their comforts for the overnight. "Check out my crib here," one told ABC News. "See, I've got my nice little chair here." In the midst of the hubbub, one figure stands out. He is friendly, unassuming and, even though he's been to nearly 100 campouts, he's as excited to pitch his tent in the parking lot as any of the other campers. "Hi, I'm Dan," he introduces himself to one group. "Can I get a picture with you?" "Would you guys like to go take a little kitchen tour?" he asks another. Dan is Dan Cathy, the president of Chick fil-A. "My name is Dan Cathy and I work here at Chick fil-A, and I like to say that I work in customer service at Chick fil-A," Cathy told yet another group with an understated smile. And yes, he does stay overnight in a tent pitched right there in the drive-through lane. Why does he keep coming out? "I'm a party animal, I love it, I enjoy it," said Cathy. "It's a lot more fun being out here than being in the hotel room. I just enjoy being with the customers and talking to them." To be sure, some of the campers come for the chicken. But for most, celebrating on Wednesday is a way to honor what the restaurants do on Sunday. Which is this: They close. "Every employee knows ahead of time Sunday is their day," said Libby Knupp, who, with her husband Jake, is a veteran of more than 35 overnights around the Mid-Atlantic and Southeast. "They are on no schedule, they can plan, it's family time, it's a good thing." Another camper, Elva Cummins, also praised the policy. "We like Chick fil-A because they are a very Christian people, they don't work their people on Sundays," said Cummins. Asked where it says, in the Bible, to honor the Sabbath, camper Justin Dardee, a college student, promptly gave the reference behind the corporate policy. "Exodus, chapter 20," he said. "Remember the Sabbath day by keeping it holy," the passage reads. "Six days you shall labor and do your work, but the seventh is the Sabbath to the Lord, your God, on it you shall do no work." But this corporate policy doesn't actually come from biblical teachings. In fact, it has much more practical origins. One of Cathy's favorite stories -- he tells it often -- is how his father, Truett, opened his first restaurant. "We opened on a Tuesday, the 23rd of May 1946, but by the time Sunday came, he was exhausted," said Cathy. "He was just worn out. And Sunday was not a big trading day, anyway, at the time. So he was closed that first Sunday and we've been closed ever since. "He figured if he didn't like working on Sundays, that other people didn't either," Cathy said. "He said, 'I don't want to ask people to do that what I am not willing to do myself.'" Though the closed-on-Sunday rule wasn't really created because of the Biblical fourth commandment, most customers have no trouble believing that it was, thanks to a strong spiritual component in Chick fil-A's corporate philosophy. Darkness had fallen, but the Dallas grand opening celebration showed no sign of winding down. There was a Happy Birthday shout-out, the usual celebrity responsibilities (signing autographs, getting pictures taken) for Cathy, and free ice cream sundaes. "We just appreciate what you do corporately and we wanted our sons to meet a really strong Christian businessman that does things right," a woman told Cathy. Cathy played the trumpet, then climbed on a chair for a serious conversation with the campers gathered inside the restaurant. "The corporate purpose that Chick fil-A has is something that I would want to put on my tombstone," he said. "That we're here to glorify God by being a faithful steward of all that is entrusted to us and to have a positive influence on all that come into contact with Chick fil-A. "We had sensed that God's divine direction was in the business and that we wanted to acknowledge that -- the Bible says that, as Solomon says in Proverbs, 'if you acknowledge me in all your ways, I will direct your paths.' And we sensed that God had directed our paths." Acknowledging that God had directed their paths has been a successful business plan. There are now 1,600 restaurants, with sales growing to about $3 billion this year. It's a tough place to get a job, though. "It's kind of legendary," Cathy said, laughing, of the interview process required for someone to become an owner-operator of a Chick fil-A. "It's said that it's easier to get a job with the CIA than it is with CFA. And we try to live up to that reputation." Last year, 25,000 people applied to be owner-operators, the company's version of franchisee. Only 100 were picked, based on Cathy's three C's: competence, chemistry and character. "Character is very important to us," Cathy said. "People that are values-driven, people that are principles-centered, people who have a sense of who they really are and aren't trying to figure out who they are, but they know who they are." Is there a fourth C, Christian? "Not at all," said Cathy. "We know that Christian values, Biblical values, are important, but we found that it's not an issue of religious labels. We have a wide range of folks that identify with these principles. They have a lot of different religious preferences that are there and it spans the whole gamut. ... They have to be honest, they got to be people of integrity, they got to be passionate about what they're doing -- so we find some of those core values, you know, are common among people of all faiths." Cathy believes the company's involvement in its employees' lives is good for business, too. "Well, we genuinely know the full circle of this because if we care enough about them behind the counter, over the long haul, the ambience of that spills over this counter, and customers can kind of sense this: these people are for real. "I like to tell people the food tastes better on Mondays because we're closed on Sunday. And I generally think that's true -- because a big reason why the food tastes good is because of the warmth and the hospitality that people sense when they are in here." John Flatley has been with Chick fil-A for 16 years. Now he's the owner-operator of a new restaurant in La Plata, Md. "The corporate purpose statement meets my personal values, to be a faithful steward of everything God has entrusted to me and to have a positive impact on everyone that comes into contact with Chick fil-A or, in my case, me," said Flatley. "It is just nice to be in a business where that is your focus. It's not about selling chicken, how much money can we make. All those things are important -- if we don't do that, we're not going to be in business. But it's about the opportunity to have a positive influence, whether it's on the team members that I work with, the vendors that we deal with or on the community in general. "People come up and thank me for being involved in the community, thank me for being closed on Sunday, thank me for the positive impact I've had on their lives, and then they tell us what great food we have. Cathy's speech to the campers includes a little bit of sales. "Chick fil-A P.J. bottoms -- you can purchase these pants, they're available on Chickfila.com," Cathy said about his own apparel, the black flannel P.J. bottoms printed with the company's logo. And it includes a little bit of scripture, delivered with a light touch for the late-night crowd. "There is a God in heaven that loves all of us very personally, he knows us by name, the Bible even says He knows how many hairs are on our head. Now He just has to hold up less than 10 fingers for me. "Nonetheless, he says here, give thanks in all things -- even while you are camping out and it's 90 degrees at midnight -- be thankful in all circumstances, for this is God's will. "Hey, let me lead us in a word of prayer if I could, 'cause I have a lot to be thankful for. Because I have a wife I get to go home to tomorrow afternoon, I have two sons, I have a great place to work, I exercise and I run so that I can drink these delicious 700-calorie homespun peach milkshakes." Eventually, Cathy heads back to the drive-through lane, where there's a spot to pitch his own tent. "I like the drive-through side because it's usually a bit quieter, not as much music," he said. Cathy has another reason to appreciate the drive-through: more than 60 percent of business comes down this lane. After hardly enough time to get comfortable on the concrete, Cathy is back up with a trumpet -- this time to signal the grand finale. The first 100 customers get their chicken meals, and as soon as that parade is finished, the restaurant opens. There's business to be done, because remember, in the Chick fil-A world, there are only six days to get that business. Does Cathy ever go into a mall on Sunday, and see a dark, shuttered Chick fil-A, and see all the other stores open, and think, maybe? "I think, isn't that incredible, isn't that neat?" Cathy said. "That we can be closed on Sunday? We're generating more business in six days than all these other tenants are generating in seven? And we can be with our family." Providing nourishment for the body as well as the soul.